Hi there!! I am desperately trying to find a gray kitty cat by Manhattan Toys. 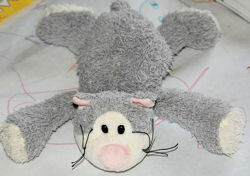 My daughter was going through her toy box FULL of stuffed animals one day and happened to find this little gray kitty. He is not very big, maybe just a little bigger than a beanie baby. This is the ONLY stuffed animal out of the whole toy box she grabbed and is now so attached to him that she doesn’t let him out of her sight. We even have to give “kitty kitty” (that’s his name) a bath in the bath tub with her. We put him in the dryer afterwards to dry and she stands in front of the dryer the whole time crying just waiting for him to be dry. PLEASE HELP!!!! He is not very big, maybe just a little bigger than a beanie baby.